A conceptual level design project cost estimate (MCACES-MII) for a proposed solution for each site. 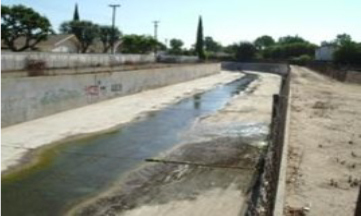 Based on field conditions, DRC determined the viability of designing a conceptual 25-year flood control storm drain plan. The determining factor is analyzing the capacity of the receiving disposal point based on the watershed evaluation of the drainage facilities. DRC reviewed the existing utility pipeline profiles to determine a practical bypass for the feasibility level, storm drainage system at each of the 10 sites. We performed conceptual-level hydraulics grade analyses to show that the downstream end of the project can receive the additional flow moving through the proposed storm drains to the terminus point. The project plans include information about the existing drainage facility and how it is being modified to remediate the local flooding at each site. The feasibility-level design plates included standard drawing from the “Green Book” Standard Plans. The final document also included a conceptual-level, project-quantity take-off and site-specific project cost for each site. Unique and innovative solutions under the constraints of the existing flow gradient and/or real estate limitations in an urbanized area to reduce flood risk to homes also were addressed. They included underground storage, park site detention, median detention, school ground detention, watershed planning, and others.